When people go to the spa they are looking for a relaxing time where they can decompress and focus on themselves. The spa experience is all about mind and body rejuvenation as well as relaxation. It should be a time where clients are taken care of and do not have to worry about anything. Let Medico Professional Linen Service help you pamper your clients when they go to your spa with fresh and clean sheets, towels, and robes. 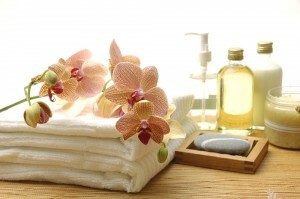 Our spa clients can choose to stock their business with premium spa linens that will differentiate them from the rest. Clients will keep coming back to experience the luxury that your wellness center provides them. At Medico Linen Service we provide a vast assortment of different spa linens perfect for any wellness center or spa business. Our linen inventories include premium sheets, premium pillowcases, deluxe bath towels, deluxe massage towels, robes, and wraps. These items come in different specifications to make sure we have something to match your unique needs. The linens come in various colors and sizes to make our linen service more customizable to your specific facility. Our spa linens are made of only the best quality materials to ensure our customers and your clients are always satisfied. Our linen service follows the strictest OSHA guidelines in conjunction with the HLAC requirements. From the collection and handling of soiled textiles to washing, extracting, and drying to packaging, storing, and delivery of hygienically cleaned goods, we abide by the safest and hygienically clean processes and guidelines. This ensures your clients will always have a positive experience. Contact Medico Professional Linen Service today at 800-464- 6334 to speak to one of our helpful representatives and get a free personalized quote. Start a new spa linen service today and see how we can help your business!